Madia elegans, also known as common madia or tarweed, is not your typical pollinator plant. In early morning light, the bright yellow flowers look like typical daisy-style composites. But during a hot summer afternoon, it is so nondescript as to go unnoticed, taking it’s skinny place among other quiet dryland species in the western United States. I promised you crazy, so here here are some oddities about this pollinator plant that set it apart from others. The flowers of this plant close in the morning, re-open in late afternoon, and remain open until mid morning the next day. According to an article in SFGate, the petals of this plant are prone to water loss. So to conserve water in the heat of the day, the flower just balls up and hangs tight. The petals don’t close in the normal way, but roll up like used carpets. The tips roll in first and wind up until they reach the central disk. Sometimes the petals have a red splotch on one end, making a dark ring around the central disk. Most plants that close during the day and open late are pollinated by creatures of the night, such as moths and bats. But this plant, from all appearances, seems to be pollinated by bees and butterflies. The plant is great for native bees because it begins to flower in June (or even earlier in some locations) and persists into the fall. Many native bees, especially those that forage in early morning and late afternoon, can make good use of this plant. But the fact that is is closed at midday makes it a poor choice for honey bees. Some people report that the foliage smells like pineapple. Like sunflower seeds, the fruits are edible and have been used by native tribes, especially ground into flour or baked. Obviously, the phenology of this plant is poorly suited for mid-day foragers such as honey bees. Some beekeepers have reported sampling by honey bees, but not sustained foraging. One beekeeper in southern Oregon suspected she had a small fall flow from it, but she described the honey as bitter. “Spitable” was her exact word. One final note. The name “tarweed” is also given to plants in the the genus Hemizonia and Deinandra. It is possible that some reports of surplus tarweed honey actually belong to plants in one of these other genera. 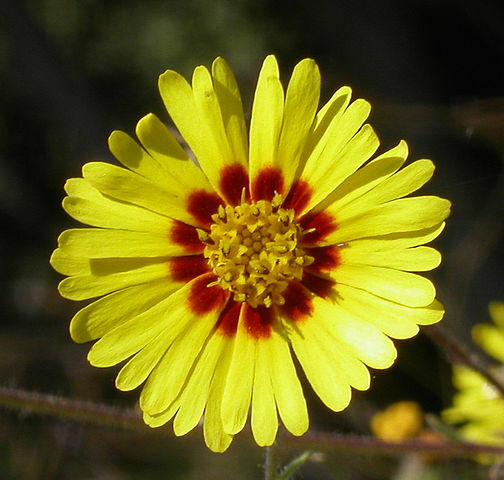 Madia elegans by Calibas. Public Domain, https://commons.wikimedia.org/w/index.php?curid=2824057. I have been enjoying bumble bees on my collarette dahlias and cosmos all summer. Suddenly, it seems they are almost all gone! Pretty much all I see in the garden and on my trumpet flower vine are honey bees. It seems too early for them to be hibernating – doesn’t it? Anyone else around Portland, Oregon noticed this? I looked up the average first frost date for Portland and found it to be 10/18. All the remaining workers will die at first frost, and the queens should all be in hibernation by then. All things considered I think it’s a little early for all of them to disappear, although it is strongly related to species. Some species will be done sooner than others. Have you had any really cold nights yet? Another possibility is that they started earlier this spring. They only live a certain number of days on average, so if they started earlier than usual they may finish up earlier as well. Just a thought. Rusty, thanks for the tarweed story. Never thought to try it in our garden, but it seems quirky enough to deserve a home here. I’ll guess that Marilyn hasn’t had frost yet — dahlias are my frost meter, less tough than bumbles in this regard. But I agree, Rusty — the bumbles may well have gone to ground. The queen / colony seems to have a set number of generations built in. Usually once the queen lays a generation of new queens (and drones) her work is mostly done and the nest breaks up. This time of the year a nest can have big numbers (for bumbles). Some species of bumbles breed many drones, and in some species workers lay most or all of the drone eggs, (maybe the same species). AND, in some species — including the common west coast Bombus vosnesenskii –daughter queens will sometimes take over a colony from the first queen. A successful multi-generation colony can produce a thousand bumbles. So when a colony perishes, usually naturally sometimes catastrophically, a specific area could see a large drop off of numbers. A few weeks ago I was lucky enough to witness a fresh queen dig herself into the ground for the winter. All (human) work stopped for a while. When I was working in a honey extracing room many years ago north of San Diego, we would come across supers with a bright yellow honey that was very strong tasting, not something you would want on your toast. We were told it was from tarweed. So…just confirming that in some situations bees have made tarweed honey here in the past. No, it definitely hasn’t frosted yet in Portland. It’s gotten pretty cool -42 degrees once. It just seemed strange that all of several varieties of bumblebees all disappeared at once. Where do they overwinter? Do they dig into plain dirt? Does it need to be somewhat protected or dry? I have watched them crawl around in spring trying to get wings going, but never sure exactly where they were nesting. This spring I saw both Bombus occidentalis and vivisenski emerge from “somewhere” close to me, while I was planting seeds. Occidentalis literally crawled up out of the soil. Most bumble queen queens overwinter in a pencil-sized hole in the ground, just wide enough for her. And yes, somewhat protected and dry. After they emerge they look for a nesting site.